Strawberry Rhubarb pie has been a part of my last five meals... okay, maybe six. You think I'm kidding. Between this and the sweet tea I'm chugging, I'll be in a diabetic coma before long. My Memorial Day activities included a few hours in the kitchen putting together my first homemade pie. I've had a hankering for Strawberry Rhubarb pie since we went strawberry picking in Edisto a few weeks ago. This was my first experience using rhubarb, so of course I under-bought the amount that my recipe called for. 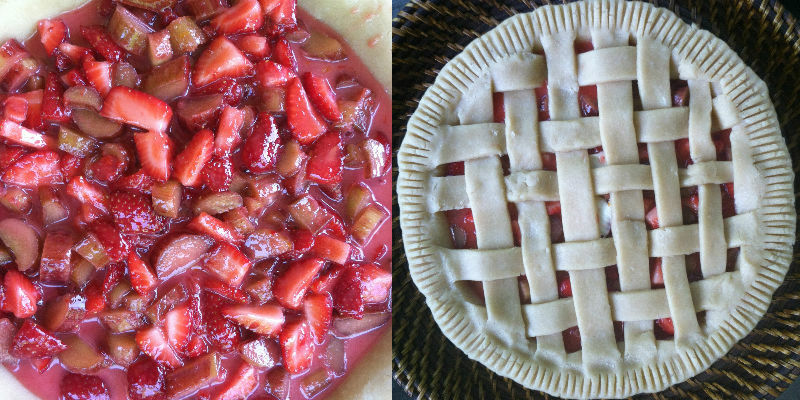 Because of this, I had to adjust the amount of strawberries and cornstarch in my pie. Purchasing rhubarb turned out to be quite the conversation starter. I heard stories of yummy grandma-made pies from a couple people in the grocery store while checking out. Because this was my first homemade pie crust, I was slightly intimidated. I actually bought a couple frozen pie crusts just in case my efforts were a total bust. I used Martha Stewart's recipe for Pate Brisee. If you have a food processor this is seriously way too easy and is certainly better than the pre-made store bought ones. I look forward to using this pie crust for my Pecan Pies in the fall. You can easily freeze the dough, which will definitely be handy during the holidays. I read somewhere to "sweat" the rhubarb so it's not as tart. In order to do this I sprinkled a little sugar over the chopped rhubarb and let it sit while I made the crust. I added so many extra strawberries to the filling which created a good a bit of liquid in the mixture. I was scared to add all of the liquid to the pie, so I added the fruit first and then spooned about a cup of the liquid over the filling. The lattice crust was pretty fun to make. I watched a youtube video for a tutorial on how to weave the crust. Call me lazy, but I didn't do a egg wash or a sugar sanding on top. Below is the recipe I used with the modifications I made along the way. The pie takes forever to bake, so you should grab an Abita Strawberry Harvest Lager to help pass the time. Preheat oven to 375 degrees. Make the filling: Mix together rhubarb, strawberries, granulated sugar, cornstarch, zest and juice. Make the crust: Roll out 1 disk pate brisee to a 1/8-inch thickness on a lightly floured surface. Fit dough into a 9-inch pie plate. Pour in filling; dot top with butter. Refrigerate while making top crust. Roll remaining disk pate brisee to a 1/8-inch thickness on a lightly floured surface. Cut into at least 15 1/2-inch-wide strips using a fluted pastry cutter (I used a pizza cutter). Lay 8 strips across pie. Fold back every other strip, and lay a horizontal strip across the center of the pie. Unfold folded strips, then fold back remaining strips. Lay another horizontal strip across pie. Repeat folding and unfolding strips to weave a lattice pattern. Repeat on remaining side. Trim bottom and top crusts to a 1-inch overhang using kitchen shears, and press together to seal around edges. Fold edges under, and crimp as desired. Refrigerate for 30 minutes (I never refrigerated my pie before baking). Brush crust with egg wash, and sprinkle generously with sanding sugar. Bake pie on middle rack, with a foil-lined baking sheet on bottom rack to catch juices, until vigorously bubbling in center and bottom crust is golden, about 1 1/2 hours. (Loosely tent with foil after 1 hour if crust is browning too quickly.) Transfer pie to a wire rack, and let cool for at least 2 hours (preferably longer) before serving.